More than half of U.S. consumers are now using smartphones and Verizon comes out as the winner in terms of selling the most devices in the country. 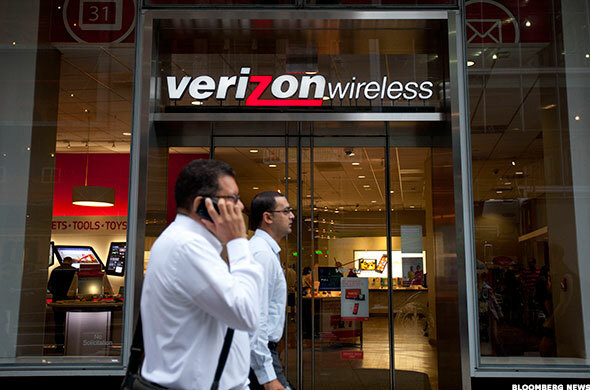 NEW YORK (TheStreet) - More than half of U.S. consumers are now using smartphones and Verizon (VZ - Get Report) comes out as the winner in terms of selling the most devices in the country. Smartphone penetration in the U.S. jumped 10 percentage points to 55% in the first quarter of this year over the first quarter of 2013, according to Kantar Worldpanel ComTech's OS barometer. Verizon holds the largest share of smartphone users in America with 33%, followed closely by AT&T (T - Get Report) with 30% share and T-Mobile (TMUS - Get Report) trailing at 10% of smartphone share, the research found. Sprint (S - Get Report) was not named in the report. Smartphones accounted for 74% of all U.S. mobile phone sales in the first quarter, up from 65% of overall sales in the year-earlier period. Approximately 57.6% of U.S. smartphone sales in the first quarter were on Google's (GOOG - Get Report) Android operating system, up 8.3 percentage points from the year-earlier period. Of the consumers who did not currently own a smartphone, 44% were unsure if they planned to upgrade to one in the next 12 months, Kantar found, and about 19% said they definitely would not upgrade to a smartphone device. "The cost of new devices and data plans was cited as the biggest reason for consumers' indecision, while lack of interest and basic need fueled the outright smartphone rejection," Kantar said. But that might change. Carriers are engaging in a price war in order to win market share, with T-Mobile's "uncarrier" plans really shaking things up. T-Mobile has been aggressively trying to grab market shares by eliminating consumer "pain points," specifically the issue of locking customers into two-year contracts. T-Mobile has been rolling out programs to entice customers to switch their carrier, with the latest three offerings announced in April, where the company under the "Simple Starter," "Tablet Freedom" and "Overage Freedom" - eliminated all domestic overage charges for consumers, even those on legacy plans. T-Mobile had announced in March 2013 its "Simple Choice" plan that offered no annual service contract and low out-of-pocket costs on smartphones. Should You Buy a Carvel Franchise? Does Target's CEO Departure Signal 1Q Earnings Pain?